The Expando C715 is based on the VIA CN700 Chipset motherboard series which is designed for the new generation VIA C7™ processor family that delivers a high performance and professional desktop platform solution. The VIA CN700 is fully optimized to provide an outstanding HD digital media experience. Featuring the all new high bandwidth V4 bus as well as support for DDR2 memory modules which is expandable to 1GB. The Expando C715 series are integrated with VIA Graphic UniChrome™ Pro IGP graphics core, the chipset features the Chromotion CE Video Display engine with hardware MPEG-2 playback. 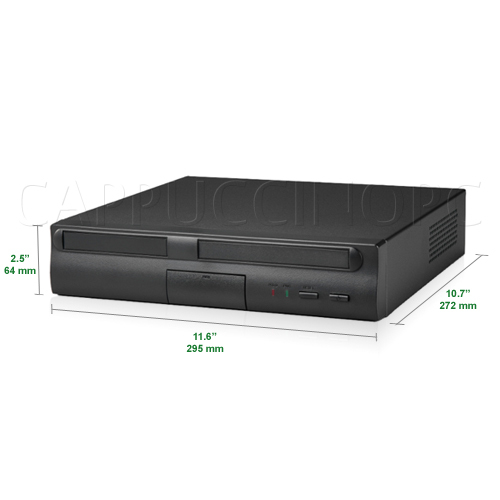 Together with an advanced 2D/3D graphic core, the Expando C715 offers exceptional playback and streaming of various digital video formats while maintaining ultra low power consumption and exerting minimal load on the processor. The Expando C715 also provides extensive display support with outputs to CRT, LCD and standard definition TV as well as support for HDTV up to 1080p resolution. The new VIA C7™ processor is the smallest, lowest power, most efficient and most secure native x86 processor in the world. Built on the advanced VIA CoolStream™ architecture, the , Esther, Core of the VIA C7 processor is designed to extend the digital lifestyle by combining robust performance of up to 2.0GHz with ultra low power consumption and highly efficient heat dissipation. In addition to the world,s best random number generator (RNG) and AES Encryption Engine in the previous processor generation, the VIA PadLock Security Engine in the VIA C7 processor adds SHA-1 and SHA-256 hashing for secure message digests, and a hardware based Montgomery Multiplier supporting key sizes up to 32K in length to accelerate public key cryptography, such as RSATM The VIA C7 also provides NX Execute Protection, providing protection from malicious software such as worms and viruses, and is used in Microsoft Windows XP with SP2. Integrating security directly onto the processor die ensures speeds and efficiency many times that available in software, yet with negligible impact on processor performance.